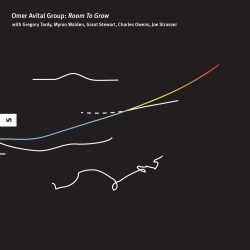 This series of recordings documents the evolution of the seminal Omer Avital Sextet and is drawn from an archive of recordings made by me from 1995-1997 at Smalls. The first volume, Asking No Permission (SRCD-0011), was representative of the first six months of the Omer Avital Sextet from early 1996. Here in the second volume we move to the next phase in the group�s development, beginning around June 1996. By late 1996, band members Ali Jackson and Mark Turner were getting to be heavily in demand for outside commitments, and correspondingly less available for weekly performances at Smalls. To suit the requirement for sustained involvement as well as strong playing, Avital cast drummer Joe Strasser and tenor player Grant Stewart to his ensemble to replace Jackson and Turner. This recording was made some time in the period between December 1996 and March 1997, though the exact date is presently unknown. The disk title Room To Grow comes from the headline of an article by Ben Ratliff in the New York Times on March 9th 1997, which reads: �No Labels, No Marketers, Just Room To Grow.� This is an apt way to describe the development of the Avital group during this period. The steady weekly � sometimes twice weekly � gigs at Smalls afforded the band the means to keep developing. The prolific 26 year-old Avital was moving forward rapidly, arriving at Smalls almost every day with new tunes as well as new interludes, countermelodies, shout choruses, and backgrounds for existing works. The music during this phase is characterized by some new influences and a corresponding shift to larger pieces and longer forms. The resulting music has honesty. The musical occasion I think compels honesty. Avital sets the stage musically and accords each soloist the full space, and thereby also his full trust, while the audience and the other members of the group bear witness. [Whosoever is given the rudder is entrusted to not run the vessel aground.] This in turns imbues the soloist with a sense of responsibility. So the sense of �testimony� is palpable. Furthermore, with the player able to discard and re-institute conventions freely, the listener has to abandon expectations, leaving little recourse in anything except attentive innocence. I suspect this too compels the soloist to be honest in somewhat the same way that one feels compelled to speak honesty to innocence. Avital, Tardy, Walden, and Owens had been together at this point for nearly two years, rehearsing and playing constantly. I praised them at length in the notes to the first volume of this series, and that applies to this volume a fortiori. The newer additions, Strasser and Stewart, themselves veterans, assimilated into the group quickly and by the time of this recording they had been performing the material already for months. Both are extremely talented. Strasser has impeccable time and feel, and can instantaneously summon up everything from a patter to a thunderous climax in a way that suits Avital�s dramaturgical sensibilities perfectly. Stewart has a masterful command of all the traditional forms of melody and harmony, and here he spins remarkable lines that ring with truth. The basic character and workings of the group had been well refined by this time and the complex arrangements had been internalized to the point where they are everywhere rendered fluidly on this recording. The group is like a six-piece orchestra that can travel fast and turn on a dime. They create the kind of excitement that one sometimes feels in the presence of a great working group that has an entire repertoire of surprise moves that they are able to coolly spring on you. I say here again that this group exemplifies the better of the newer jazz styles both in its artistic integrity, and in the way that it integrates new elements in a natural way without sacrificing or simplifying the form, and without merely copying what came before it. This is an achievement that has not been equaled many times in the ten years since this recording was made. The producer would like to thank Debbie Millman, Tom Currier, Marcy Granata, Jeff Brown, and Yutaka Matsumoto for their gracious assistance, without which these projects would not have been possible. We are especially grateful here to designer Paul Sahre for contributing his keen aesthetic sensibilities as well as his labor in creating a striking new look and new designs for Smalls Records. Thank you also to Loren Flaherty and Ulrike Schwach for their design contributions.